I wasn't planning on getting this post up tonight but I think I need to. This particular prelude and fugue, the C-sharp minor from book 2 of the Well-Tempered Clavier, has been somewhat of a nightmare for me, which is highly unusual because I love Bach, I live Bach, I rely on Bach to give me peace of mind. So what's the deal? Why all the angst? First of all, the fugue has a lot of notes that never stop and I've had a very difficult time figuring out how to practice it so that I can simply get through it without stopping. If you're interested, you can read more about this particular struggle in a post I wrote back in July - "Living Life on the Edge - a practice technique discovery." By the end of the post I was feeling pretty optimistic. I was forecasting a successful recording in the near future. Well, it's September now and as you can see, that prediction was a bit premature. In spite of some new practicing techniques - playing the music backwards, practicing in short little bursts up to tempo - I still couldn't make it through. And the Prelude. I usually like slower Bach movements but this one had me stumped. It's long and there are ornaments all over the place - implied ornaments, written-in ornaments, ornaments that aren't written in but probably should be there somehow, ornaments I had never seen before ("acciaccaturas" are not Italian sneezes, believe it or not!) You can read all of my bellyaching about it in, "Play it again Sam...and again, and again, and again..."
I hear the prelude as being a slow movement in trio-sonata form, meaning 2 melodic voices accompanied by a bass line. One can hear the melodic material being passed from one voice to another, and even to the bass part at times. Every once in a while the mostly melancholic sound of the prelude breaks and the voices strain towards something more dance-like but these attempts at lifting the mood never last very long. It's as if the pull of raw emotion is too great to overcome. For me personally, this piece is all about my journey thus far as a mother. I've talked about it a bit in another post but basically I've had a very challenging time dealing with this change in my life and figuring out how to balance my passion for music with my love for my family. I had post-partum depression and extreme anxiety for most of my daughter's early years which you may be able to hear in the beginning material of the prelude and when it returns later on. The lighter, more graceful music in the middle I associate with the times when the awesome and wonderfully child-like natures of my daughter and husband have worked their magic, pulling me out of myself and into their arms. The fugue. I don't know what more to say about this fugue. It's hard. It's fast. And it only lasts two quick minutes. If you like scavenger hunts, see if you can hear the subject when Bach uses its inversion or in non-musical terms, when it's upside-down. I have this sneaking suspicion that Bach probably had a grand old time playing this fugue and knocking the socks of everyone around. So here's the fugue...it's not perfect, not even close, so please do be forgiving. I promise I'll re-record it someday, when I'm on friendlier terms with it. All right, I'm done now. Tomorrow I climb a new mountain! Images of snow and ice, images of a frozen heart - "Wasserflut (Floodwater)" & "Auf dem Flusse (On the River)"
Franz Schubert was a master at using keys and their relation to one another to create specific atmospheres and to link material together. In a song cycle, these types of connections have the same effect as a leading sentence at the end of a thrilling book's chapter has - it makes it almost impossible not to turn the page, or in music, to continue with the next song. Such is the case with the last song I wrote about, "Der Lindenbaum (The Linden Tree)" and the following two songs in Winterreise, "Wasserflut (Floodwater)" and "Auf dem Flusse (On the River)." "Der Lindenbaum" begins and ends in D major. With the exception of the brief winter wind that sweeps through it, to me the song represents comfort and peace. But with the start of the next song, "Wasserflut," that warmth is immediately frozen with the simple change of one note, F# into F-natural. We are now in the key of D minor, a much darker, icier key and I can picture this sudden subtle change in the face and heart of our traveler. How appropriate for a song that talks of frozen tears falling into snow, ice breaking apart, burning woe, and burning tears; for a song in which Schubert indicated several times that the voice part should be sung "stark," which translates to "driving, violent," or "intense." 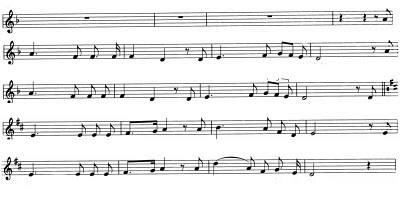 Schubert further highlights this changed atmosphere by pitting two rhythms against one another repeatedly - slow triplet eighth notes and dotted rhythms. We're still in the same key of D minor but with the simple piano introduction, it seems as if our french-horn player has found enough will within him to start walking again. While he walks, his mind and heart mirror the frozen stream that is beside him. After two brief verses in D major, as he remembers his beloved again and their first moments together, the piano comes to an abrupt pause, a cliff-hanger, before returning to the plodding, sorrowful march for the last verse. Your image in this brook? The piano part takes over the storm and pain that runs beneath the frozen ice, leaving the voice part to become a spectator, only stepping in to join the river when the pain becomes too much to bear. I have to turn the page. How about you? Here are videos of tenor Ian Bostridge performing these two songs with pianist Julius Drake. Don't forget to breathe...they are breathtaking! Click here to see translations of these songs. The beginning of my own "Winterreise"
Beginning with a farewell: "Gute Nacht (Good Night)"
When music is more than music: Winterreise's "Die Wetterfahne (The Weathervane)"
Back on the road again: "Gefrorne Tränen (Frozen Tears)"
Psychology through music: Winterreise's "Erstarrung (Numbness)"
Finding a place of comfort: Winterreise's "Der Lindenbaum (The Linden Tree)"
"Sturm und Drang" encapsulated in song: Winterreise's "Rückblick (Backward Glance)"
No rest for the weary: "Irrlicht (Will-o'-the-wisp)" and "Rast (Rest)"
Experiencing a lucid dream through music: Winterreise's "Frühlingstraum (Dream of Spring)"
On the edge of a dream: "Einsamkeit (Loneliness)"
Lifted above despair: Winterreise's "Die Post (The Post)"
Choosing a different path: "Der greise Kopf (The Grey Head)" and "Die Krähe (The Crow)"
A lesson in painting with music: Winterreise's "Letzte Hoffnung (Last Hope)"
An unsuccessful attempt at resisting sleep: "Im Dorfe (In the Village)"
Nearing the end of one man's journey: "Der stürmische Morgen (The Stormy Morning)" & "Täuschung (Illusion)"
An intimate view of facing one's fate: "Der Wegweiser (The Signpost)"
Waiting for Death: "Das Wirtshaus (The Inn)"
Seizing control of life & death: "Mut (Courage)"
One final breath: "Die Nebensonnen (The Mock Suns)"
What remains: "Der Leiermann (The Organ-grinder)"
At the tail end of the introduction, Schubert brings in another symbolic sound, one that is very familiar to our main character - the call of french horns with its own echo in the distance. I can't imagine a sound more comforting than this. When I see or hear a piano, I can feel my nerves returning to normal, my breathing slow down, and my heart resting on the simple glory of music. Perhaps this is what the composer intends for anyone listening to or performing this song. And here is the piano part for verse one. If you're feeling brave, try singing the vocal line at the same time. Very simple, almost like a horn choir accompanying the voice. In this verse there is more movement again, and definitely a bit more sorrow at first, as the poem mentions "darkness," "depths of night," and "closed eyes." But then the horn choir returns with the switch to major and our travelling horn player finds comfort in the linden tree's song of peace. The third verse is quite a contrast to the first two. We get tossed into an abrupt, cold, windstorm that causes our protagonist's hat to fly off his head. The fast-moving triplet figure returns, but with a sound that is somewhat reminiscent of the previous song and representative of the whirling, almost-violent wind. Aha! The horn call yet again, with its echo...comfort again. Which brings us to the fourth verse with the main vocal line and yet another piano accompaniment. Feel free to sing along again so that you can feel how this accompaniment can make the melody feel different. The clip starts with the horn call from the end of the previous verse. By the end of the postlude, I get the impression that all is well with our musician-friend. Nature and music (are they different?) have steered us back onto the road before us. Only question is, what's next? After all that hard work, here is a youtube video of the bass, Josef Greindl performing with pianist Hertha Klust. Enjoy. Click here to see a translation of this song. Images of snow and ice, images of a frozen heart: "Wasserflut (Floodwater)" and "Auf dem Flusse (On the River)"
First of all, I want to say that I absolutely love this prelude and fugue. For whatever reason, they make complete sense to me. Even though they are different from one another in terms of the amount of energy with which they are imbued, playing them puts me in a bit of a hypnotic state, leaving me to feel as though my mind and spirit have been returned to a more peaceful, balanced state. I know, I know...I can imagine that I'm sounding a bit crazy at this point, but I can't help it. This is one of those prelude and fugue sets that is simply magical to me. So what is it that makes these pieces have this effect on me? The one image that repeatedly comes to mind with this prelude and fugue is the image of a spider, spinning a web. 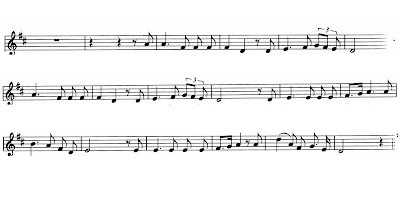 As there is symmetry in a web, there is also symmetry in both of these pieces; when one voice goes up, the other voice goes down; when one voice plays the fugue subject as written, and another places the fugue subject upside-down. Here are two excerpts that I scanned to show what I'm talking about. I even find looking at excerpts such as these calming. To be able to see and hear such beauty in symmetry is remarkably refreshing. So are there any differences between the prelude and fugue? Yes, absolutely, and it's the contrast that makes this set an exquisite pair. In the prelude we find ourselves in almost a mechanical, fast-forward drive from beginning to end without any rest. Going back to the spider-web example, it's a bit like watching a spider spinning its web with a time-lapse setting. And in the fugue, we are given the time to watch our spider spinning at its own pace. And because Bach chose to write this as a fugue with only three voices, there is delicacy that is maintained throughout which mimics the delicacy of the web perfectly. The step-wise and chromatic nature of the lines remind me of the creepy-crawliness (I know, not a word) of spiders' legs. Wait... what's that crawling...up... your... arm? Oh, and here are the videos. Enjoy! There is a very nervous, frantic energy in this piano part and the accents that appear in the left hand line on the fourth beats throughout the first verse seem like tiny jabs of pain to me, or perhaps they are a reminder of the previous song's frozen tears. Regardless, they are not comfortable and with both hands together, I can't help but picture our friend completely distracted from his journey, groping frantically for signs of his beloved. To my ears the interaction between these two voices creates a pained tension that has a different feel than the more energetic, almost uncontrollable 1st verse. I think it represents so well the torment that our horn player must be feeling at this time, as he so desperately wants to see the ground on which they once walked but that is now covered with snow. In the middle of this song, Schubert briefly brings a bit of hope, changing the key from B-flat minor (at least in my score) to G-flat major. I've always thought that Schubert is a genius when it comes to completely shifting a piece's harmonic backdrop and this is yet another example of this technique. So here we are with a few measures of hope but then quickly led right back into the real world as our main character discovers that the flowers and grass he was hoping to see are all dead, as is the love of his beloved. The piano part for the last two measures of the verse are spine-tingling. If you could translate a broken heart into musical sound, this would be it. 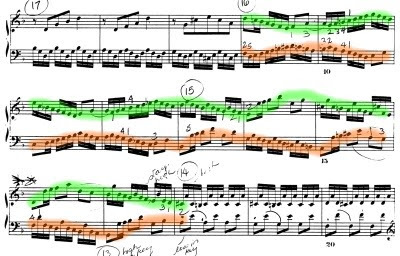 With hardly any room for breath, Schubert brings us back to the opening material to finish out the fourth and fifth verses. This makes sense to me from a psychological point of view (although I am the first to admit I am not well-versed in the topic.) When I am faced with an emotionally charged situation I too tend to go back and forth between emotions, feeling rage one minute and then abruptly switching over to sorrow. One slight difference that I find interesting, however, and that I would like to somehow acknowledge musically is that in the last phrase, Schubert extends the music by 2 measures. It is almost as if those last two measures, in which the singer sings about his beloved's image melting away as his own heart melts away, are a final cry of anguish that can only end in exhaustion. I can't help but be exhausted after playing and listening to this song. As I mentioned at the beginning of the post, I really think that this is the first glimpse that we see of the main character's mind. It's almost as if Schubert found a way to translate confusion and rage directly into music. I should add at this point, that I'm thinking the tempo should be a little bit faster than I recorded them for the purposes of this post. Stopping and starting always has a way of slowing me down and upon listening back, I am aware that playing the song at this slower tempo, I run the risk of losing the psychological aspect of the situation. A faster tempo would also ensure that everyone is breathless by the end of the song. Here is baritone Hans Hotter performing "Erstarrung" with Gerald Moore. And click here for the translation. Finding a place of comfort: "Der Lindenbaum (The Linden Tree)"
"My passion is to help others in the community, young, old, and everyone in between, find relevance and joy in learning, performing, or listening to classical music." I've struggled with this byline off-and-on for the past year, thinking that perhaps the word "relevance" is too trendy and lofty for my purposes. But after watching this powerful, tragic movie about the famous cellist Jacqueline Du Pré, and after many hours of my mind putting myself in the midst of her life as it is portrayed by the movie, I am seeing that perhaps I wasn't so far off after all. I believe that people feel joy when they feel a connection to something or someone, regardless of the nature of the music itself. The music can be sorrowful or jubilant, classical or jazz, western or eastern - regardless, if there is a genuine emotion there that connects people within a community, there will be a general feeling of joy, at least in my opinion. We all want to be part of something greater than just our solitary selves. I enjoy playing music with young musicians...I enjoy reading chamber music with other "amateurs" in the community...I enjoy performing at a nearby retirement community...I enjoy performing with my husband...I enjoy writing about music...I enjoy improvising music while my 5-year old daughter dances with abandon. I enjoy all of these things, I believe, because they involve the sharing of joy between more than just myself. I am grateful that I am not famous, that I didn't make it big because I think this sense of sharing within a community and building upon those relationships would be lost in such an environment, at least for me. I look at a musical star like cellist Jacqueline Du Pré, who seemed to thirst mostly for family and for connection with others but instead found herself isolated and mostly alone with her music, rarely, if ever seeing her art interact with community and realize that I am very, very thankful that I have the life I have. With "Gefrorne Tränen (Frozen Tears)", the third song in Winterreise, it seems that our horn player has resumed his journey. The piano part keeps a very steady, consistent rhythm throughout although this time, he seems to be walking at a bit of a slower pace. It is obviously cold out since our friend remarks that his tears are freezing as he weeps. He contrasts this image with that of his heart, which is so burning hot that it would melt all of winter's ice. Schubert chooses to set this poem in a very intimate way, with the dynamics rarely getting very loud, and with the piano offering just a little bit of support and texture under the voice part. One thing I find interesting is Schubert's use of accents and sforzandos in the piano part. They are in virtually every measure and often they are on the same pitches, but in alternating hands. They are also frequently on the off-beats, beats 2 and 4, giving the piano part, and perhaps our main character, a bit of a limp. Or perhaps those accents can represent the falling frozen tears as they pierce the snow on which he walks. I'm a little unsure whether or not those accents will actually break through the texture if I do them. Listening to the Hans Hotter and Gerald Moore recording below, I don't really hear those accents most of the time. Did Gerald Moore omit them on purpose? And what should I do? How seriously should I take this indication? 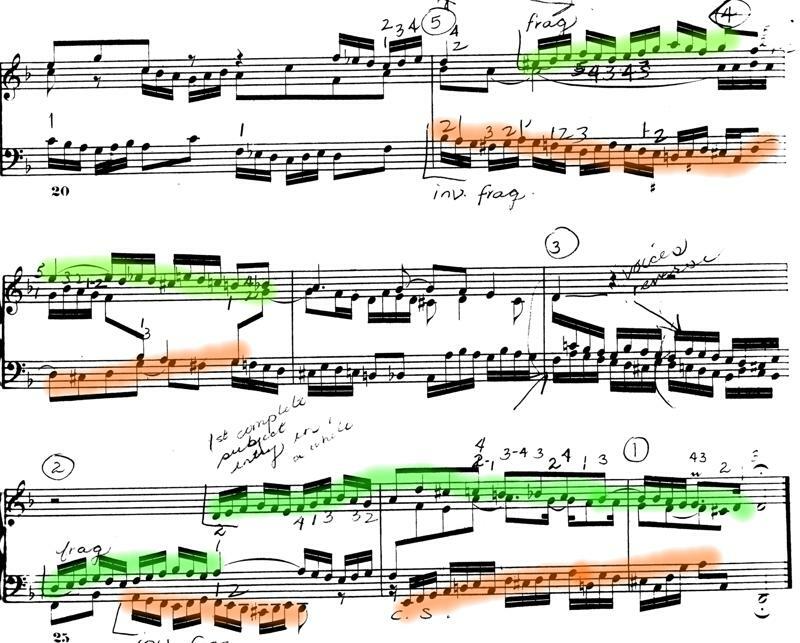 I decided to check out the autograph score and there, those markings are very clear - Schubert must have put them there for a reason. I think I'm going to do my best to preserve them, as awkward as they seem. I think they will provide some nice texture and imagery to the music. Another point that is somewhat baffling to me is that in spite of the fact that the poem talks of tears, ice, and hearts burning hot, much of the song is in a major key rather than a more sorrow-inducing minor key. I often struggle with music like this because I can so easily feel a disconnect between what the singer is saying and how the music is sounding. 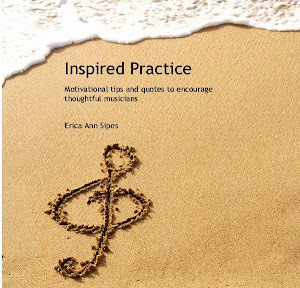 I know, I know...I shouldn't say that every piece of music that is about something sad should be in minor and anything happy should be in major, but I apologize - I can't help myself from falling into that trap. Perhaps because our friend is on his journey, walking at a steady pace, the pain that leads to the frozen tears is somewhat diluted. Or perhaps he's been in this emotional spot before in his wandering life and the act of walking helps him to move on to the next destination, to new people, to new experiences. Now don't get me wrong here, I definitely think the main character gets worked up, especially towards the end, but I also think it's a pretty short-lived emotion. Hmmm...that's got me thinking. Maybe I can learn something from this guy. Next time I'm stuck in a self-pity mode I'll try going for a walk...might do me some good! My apologies that I don't have any personal clips from this song right now...I made them but technology is not cooperating and I have 21 more songs to go. But here's a recording of mezzo-soprano, Brigette Fassbaender with Aribert Reimann at the piano. I like this particular recording because the accents are observed and because of the height of emotion that is reached, only to quickly back away and return to a more emotionless state. I know, I know. I'm missing a prelude and fugue here. I'm terribly sorry but I do believe that I'm just going to have to skip the C-sharp minor set for now. You can read about why on here. I have decided that I just want to move on for now because I am missing Bach terribly and this whole episode with that particular prelude and fugue is, well, just not happening. The fifth prelude and fugue from Bach's second book of the Well-Tempered Clavier is a fabulous contrast in many ways to the previous set. Out of the gnarled, tangled key of C-sharp minor we find ourselves in one of the sunniest, robust keys that I know of, D major. The prelude is truly hilarious to me with its mash-up of styles. 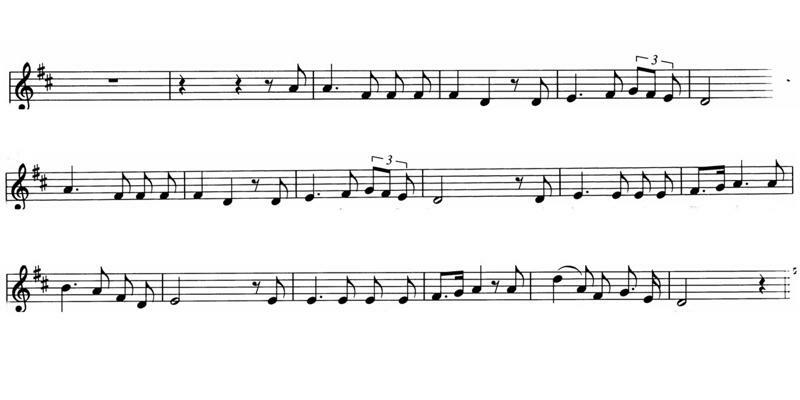 I hear a gigue with its compound, dancing and skipping rhythms, a French overture or some time of fanfare with the crisp double-dotted rhythms, a toccata with its fanciful, fast runs of sixteenth notes and also some sort of graceful smooth dance, with the more square legato, step-wise figures. Put them all together and you have a mighty fun dance that leaves me, quite frankly, out of breath. The fugue transports us from the country dance scene to the church. (Perhaps all of those rambunctious dancers needed to atone for some of their merriment.) 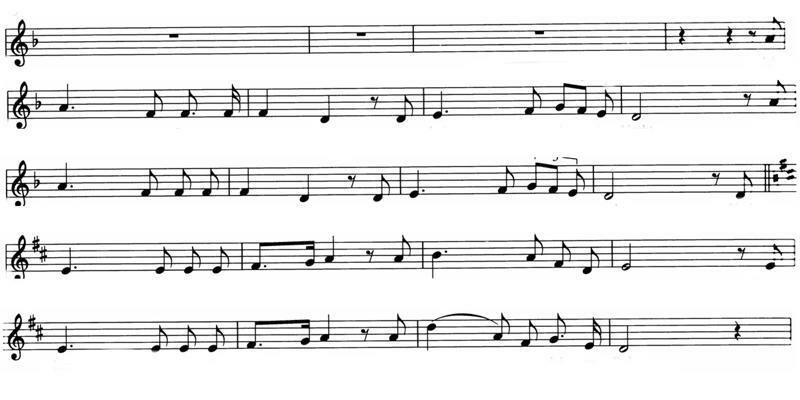 This 4 voice fugue is extraordinarily simplistic, using very few rhythms and employing few fancy subject treatments. No backwards or upside-down subjects, or subjects stretched out and slowed down. Here you just get the subject repeated over and over again, one on top of another. And since few rhythms are used, much of the time the movement is homophonic, meaning the voices move together. It reminds me a bit of hearing hymns in church. Unlike the prelude, there is a solemnity and simplicity to this fugue that helps me to put aside all of the excess energy of the day and to focus on the simple beauty of a simple subject. To me, the second song in Schubert's song-cycle, "Die Wetterfahne (The Weathervane)" is markedly different than the opening song, which is "Gute Nacht (Good Night)." I hear a difference in both parts but mostly in the piano accompaniment. In the first song, the piano part seems to primarily serve as our character's pulse or as the constant, steady rhythm of his footsteps. 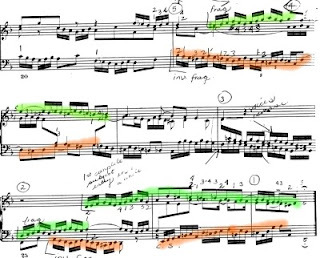 In "Die Wetterfahne," however, I see the piano part take on a role, or perhaps several roles, that directly interact with our protagonist as he begins the more psychological side of his journey. The first role that the piano plays is that either of the wind, or of the weathervane itself that represents the changing direction of his beloved's love from himself to another man. This same material is used almost identically in the postlude except for one tiny, but important difference. In the postlude there are short rests in between the bursts of wind or movement whereas in the introduction, those notes are simply held through, sustained. So why does Schubert do this? Is it even perceptible to the audience? To me, those rests are a hint as to how Schubert wanted this particular piece to end. Without the rests, I feel like driving a bit more through the wind bursts. But at the end here, I feel that the rests slow the momentum down and bring our travelling horn player, and us, to more of a state of defeat or perhaps of resignation. Another very subtle thing that Schubert does in this song is he changes the octave in which the accompaniment is written for the beginning of the first verse versus the beginning of the last verse. For the first verse, the left hand of the piano doubles the voice whereas it is the right hand that doubles it for the beginning of the third verse. This might seem like a small thing, but as the pianist, it makes me think about voicing issues. Whenever a piano line doubles an instrumental or vocal line, I like to back away from that particular hand and emphasize the other instead, thereby changing the color and atmosphere. I'm eager to try this out with a voice part in place. and I also hear some slightly raucous country dancing in very short clips, perhaps to represent how the main character's beloved and her family seem to have no problem moving on to new lovers and new marriage prospects. I mean really, what was this travelling musician thinking? Who would approve of marrying such a man? I find it remarkable that Schubert could insert so many roles into the span of such a short song and I think that by doing so, the music is much more dramatic than it would of been had he kept the piano part more accompanimental. It also gives me a bit of a glimpse into what our main character is dealing with at this early point in the song-cycle. I definitely get a sense of rage and bitterness which is a great contrast to the first song, "Gute Nacht." So where does our horn player go next, both emotionally and physically? Below is a video of baritone Hans Hotter singing "Die Wetterfahne" with Gerald Moore at the piano. Click here to get to Barry Mitchell's translation. Psychology through music: "Erstarrung (Numbness)"
Beginning with a farewell: Winterreise's "Gute Nacht (Good Night)"
Saying "goodbye" is often not only a moment of parting, but also a moment of beginning. Such is the case with the first song in Schubert's song-cycle, Winterreise. In the whole of this mammoth work, we hear of a journey that a travelling horn player takes following a failed romance. (Wilhelm Müller, the poet who wrote the poems used in Winterreise, published this set with the title, Poems from the posthumous papers of a travelling horn-player.) In "Gute Nacht (Good Night)," our horn-player chooses to pick up his things in the middle of the night and travel yet again to another town, saying farewell to the maiden that has rejected him. So this is where I begin my journey as well. It certainly would get the picture across that this cycle is one depressing piece after another. But I don't know if that really feels right to me. The main character, after all, is a travelling horn-player. My thought is that this man is actually used to moving from town to town. Perhaps this is just another inevitable move for him and the journey isn't such a dreaded affair. So maybe I should try a little faster tempo...a tempo that would fit someone who is used to travelling long distances. I think I like that better. Now it's not quite as plodding and considering the length and repetition in this particular song, I think this tempo will keep our character moving along while still allowing for some sorrow to linger. We get almost three verses with the same piano and voice parts. In the first verse the character gives us a bit of his history - he came to the town a stranger, met his lover who returned his love and gave him hope of being wed. Not saying why, he says that he must leave now and begin another journey. The second verse seems to emphasize his loneliness in the beginning of this journey and the third shows a little more of the character's attempts at pushing aside his emotions, showing his resolution instead to move on. There are just a few tiny differences between the verses which I'll have to play around with. I don't want to just ignore them. Franz Schubert chose the latter option, tying up the piece in a traditional way by ending the song as it began. For me this is also a hint of what is to come - that forgetting his beloved is easier said than done. We'll have to wait and see how it all turns out in the end and I must warn you that I may change my mind at least a few times about all of this as I continue this journey. When music is more than music: "Die Wetterwahne (The Weathervane)"